by Day, Susan X.; Funk, Robert W.; Coleman, Linda S.
For courses in Literature for Composition, Writing About Literature, and Introduction to Literature. Great literature is always thought provoking, always new – why not use it to improve your writing skills and sharpen critical thinking? 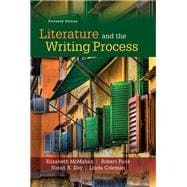 Literature and the Writing Process combines an introductory anthology with detailed instruction in the writing process. By seamlessly integrating literature and composition into one multi-purpose text, the authors enable you to enjoy, understand, and learn from imaginative literature – and to write clearly and intelligently about what you’ve learned. Text writing assignments use literature as a tool of critical thought, a method for analysis, and a way of communicating ideas. Careful integration of rhetorical instruction with the critical study of literature guides you through the allied processes of analytical reading and argumentative writing. As a result, readers learn how to write essays about the major features that are involved in interpreting short stories, poems, and plays. This title is also available with MyLiteratureLab – an online resource that works with our literature anthologies to provide engaging experiences to instructors and students. Students can access new content that fosters an understanding of literary elements, which provides a foundation for stimulating class discussions. This simple and powerful tool offers state-of-the-art audio and video resources along with practical tools and flexible assessment. Note: You are purchasing a standalone product; MyLiteratureLab does not come packaged with this content. Students, if interested in purchasing this title with MyLiteratureLab, ask your instructor for the correct package ISBN and Course ID. Instructors, contact your Pearson representative for more information. NOTE: Brief and Comprehensive Tables of Contents follow. 6. How Do I Read Short Fiction? 17. How Do I Read Poetry? IV. WRITING ABOUT DRAMA(28. How Do I Read a Play? What Ideas Should I Use? What Point Should I Make? How Should I Organize My Ideas? Dagoberto Gilb, Love in L. A. What Should I Add or Take Out? Which Words Should I Change? How Do I Discover Structure? How Will I Recognize Symbols? What Are Setting and Atmosphere? What Do the Words Suggest? William Shakespeare, Shall I Compare Thee to a Summer’s Day? What Are the Forms of Poetry?